Working as a pastry cook who attended a Culinary Arts school with a program not designed specifically for patisserie, I often wonder if I missed out. When my fellow co-workers talk about tiered wedding cake projects and colored sugar pieces, I wonder how my simple Pastry I and II classes can compare. Courses outside of work are costly, and are often demonstration driven which give little opportunity for the kind of hands practice necessary for real improvement. I console myself with the fact that I am currently enrolled in the Hands On/Learn As You Go School Of Arts, but sometimes it takes that extra step. In the past year, since arriving in Los Angeles and landing a pastry cook position, I’ve managed to transform my home kitchen into somewhat of a mini bakeshop thru Christmas presents, gift certificates, and, well, splurges. 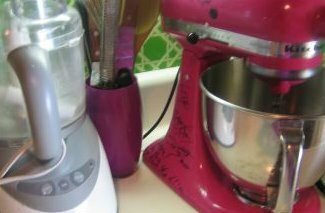 Starting with my pride and joy, a hot pink Kitchen Aid mixer signed by Mario Batali, Lee Hefter, Alain Ducasse, and Jacque Torres among others, I have built up my utensils from necessity and desire. Silpats, cutters, ring molds, a digital scale, pastry brushes, plastic bowls for melting chocolate, metal bowls for mixing, whisks, off set spatulas, regular spatulas, you name it, I probably have it. One day I cleared out all three of the drawers in the kitchen and thus my bakeshop was born. An empty flower vase became a holder for my wooden spoons and spatulas; all my piping tips, cutters, silpats, and plastic piping bags went into one drawer together. Things have a home, a place where they always belong. And when the mood strikes and I manage to find the time, I test recipes in this little bakeshop I’ve created. Of course the oven’s still a still oven and the food processor from Target isn’t quite the same as restaurant quality. A speed rack would be a wonderful addition although lord knows where I would find the space to fit it, and I still haven’t managed to purchase a blow torch, although Home Depot carries them for only thirty dollars a pop. And there’s always more to purchase, like the space heater I decided is a must after a sugar demonstration I recently attended. But for now, my little bakeshop is working just fine. Whom ever wrote this blog is a genius! And prob. really cute!